Washington Mutual was a conservative savings and loan bank. In 2008, it became the largest failed bank in U.S. history. 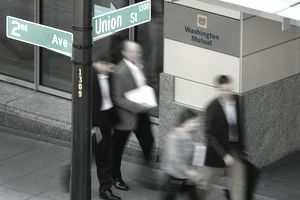 By the end of 2007, WaMu had more than 43,000 employees, 2,200 branch offices in 15 states, and $188.3 billion in deposits. Its biggest customers were individuals and small businesses. Nearly 60 percent of its business came from retail banking and 20 percent came from credit cards. Only 14 percent were from home loans, but this was enough to destroy the rest of its business. By the end of 2008, it was bankrupt. Washington Mutual failed for five reasons. First, it did a lot of business in California. The housing market there did worse than in other parts of the country. In 2006, home values across the country started falling. That's after reaching a peak of 20 percent year-over-year growth in 2004. By December 2007, the national average home value was down 9.8 percent. The last time housing prices had fallen was during the Great Depression. Nationally, there was 10 months' worth of housing inventory. In California, there was 15 months’ worth of unsold inventory. Normally, the state had six months’ worth of inventory. By the end of 2007, many loans were more than 100 percent of the home's value. WaMu had tried to be conservative. It only wrote 20 percent of its mortgages at greater than 80 percent loan-to-value ratio. But when housing prices fell, it no longer mattered. The second reason for WaMu's failure was that it expanded its branches too quickly. As a result, it was in poor locations in too many markets. As a result, it made too many subprime mortgages to unqualified buyers. The third was the August 2007 collapse of the secondary market for mortgage-backed securities. Like many other banks, WaMu could not resell these mortgages. Falling home prices meant they were more than the houses were worth. The bank couldn't raise cash. In the fourth quarter of 2007, it wrote down $1.6 billion in defaulted mortgages. Bank regulation forced it to set aside cash to provide for future losses. As a result, WaMu reported a $2 billion net loss for the quarter. Its net loss for the year was $67 billion. It dwarfed its 2006 profit of $3.6 billion. A fourth was the September 15, 2008, Lehman Brothers bankruptcy. WaMu depositors panicked upon hearing this. They withdrew $16.7 billion out of their savings and checking accounts over the next 10 days. It was 9 percent of WaMu's deposits. The Federal Deposit Insurance Corporation said the bank had insufficient funds to conduct day-to-day business. The government started looking for buyers. WaMu’s bankruptcy can be better analyzed in the context of the 2008 financial crisis timeline. The fifth was WaMu's moderate size. It wasn't big enough to be too big to fail. As a result, the U.S. Treasury or the Federal Reserve wouldn't bail it out like they did Bear Stearns or American International Group. On September 25, 2008, the FDIC took over the bank and sold it to JPMorgan Chase for $1.9 billion. The next day, Washington Mutual Inc., the bank's holding company, declared bankruptcy. It was the second largest bankruptcy in history, after Lehman Brothers. On the surface, it seems that JPMorgan Chase got a good deal. It only paid $1.9 billion for about $300 billion in assets. But Chase had to write down $31 billion in bad loans. It also needed to raise $8 billion in new capital to keep the bank going. No other bank bid on WaMu. Citigroup, Wells Fargo, and even Banco Santander South America passed on it. But Chase wanted WaMu's network of 2,239 branches and strong deposit base. The acquisition gave it a presence in California and Florida. It had even offered to buy the bank in March 2008. Instead, WaMu selected a $7 billion investment by the private-equity firm, Texas Pacific Group. Bondholders, shareholders, and bank investors paid the most significant losses. Bondholders lost all $30 billion in their investments in WaMu. Most shareholders lost all but two cents per share. Others lost everything. For example, TPG Capital lost its entire $1.35 billion investment. The WaMu holding company sued JPMorgan Chase for access to $4 billion in deposits. Deutsche Bank sued WaMu for $10 billion in claims for defunct mortgage securities. It said that WaMu knew they were fraudulent and should buy them back. It was unclear whether the FDIC or JPMorgan Chase was liable for many of these claims.